The historic Tuscarora Academy Museum in Mifflintown, Pennsylvania, which was founded in 1836, boasts a long history. 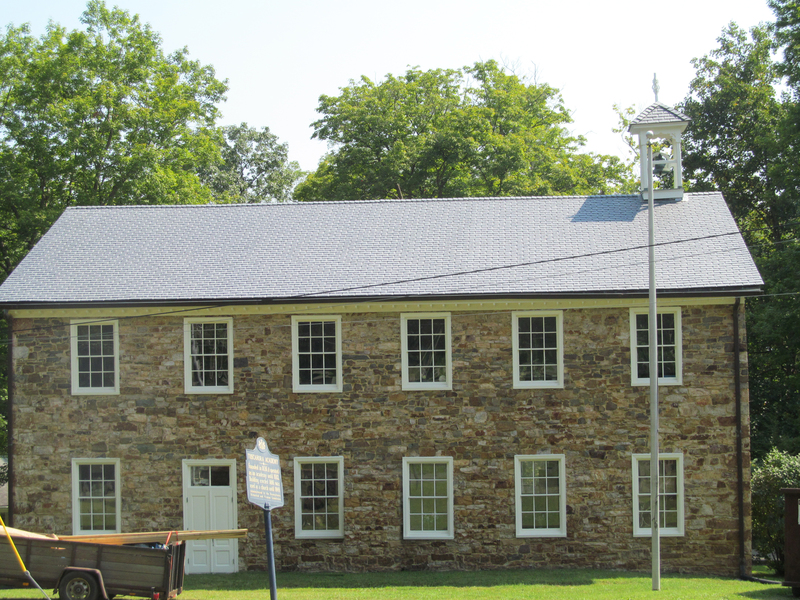 The recently-reroofed structure is the only surviving building of the Tuscarora Academy, the site of the first secondary school in Juniata County. The interior of the museum hosts an old walnut post office, a doctor's office, a typical boarding room for students and timber belonging to the David H. Wilson GAR Post 134. But, it's the outside of the structure that is causing some added interest these days. "Our team was brought in to remove 50-year old asbestos shingles on the roof," says Philip Mead, estimator with KLA Roofing & Construction, LLC of Everett, Pennsylvania. "They needed to get the asbestos removed and sought a low-maintenance product that could withstand our harsh winter weather." The Pennsylvania Historical and Museum Commission researched several roofing alternatives before selecting Single-Width Slate synthetic tiles from DaVinci Roofscapes. "We had a four-man crew install the composite slate roof and they liked working with the product very much," says Mead. "I actually heard one person say that they wish we would get more projects like this one because it went so smoothly!" The KLA Roofing & Construction team installed the Smokey Gray roof during the summer of 2015. The company, who works on many commercial roofing projects across Pennsylvania, specializes in historical restoration. "Roofing requires an understanding of a structure's form, how it bends and how water will flow over it," says Mead. "If a certain area of roof will take on a high level of rain-flow, it might be wise to spend a little extra time sealing that particular area. Another area of the roof might need extra wood to support it. A crucial piece of properly laying a roof is understanding nuances like these. That's what we brought to the Tuscarora Academy project that helped make the re-roofing projects such a success." Tuscarora isn't the only historic museum to feature DaVinci's composite roofing. See Museum Rooftops and Happy National Museum Day! for more insights.